The not-so-shocking tale on why Facebook video advertising is way overrated. I’ve recently finished running some social media campaigns for a tech-client, with creative content being served as ads on both Facebook and YouTube to USA, UK, France, and Germany. Most of this content was video and we ended up spending about 1 million US dollars. We split the budget fairly evenly between the platforms and we’re already very familiar with costs of running ads on both. A video view on Facebook is almost always going to be cheaper than a video view on YouTube — at least on the surface. 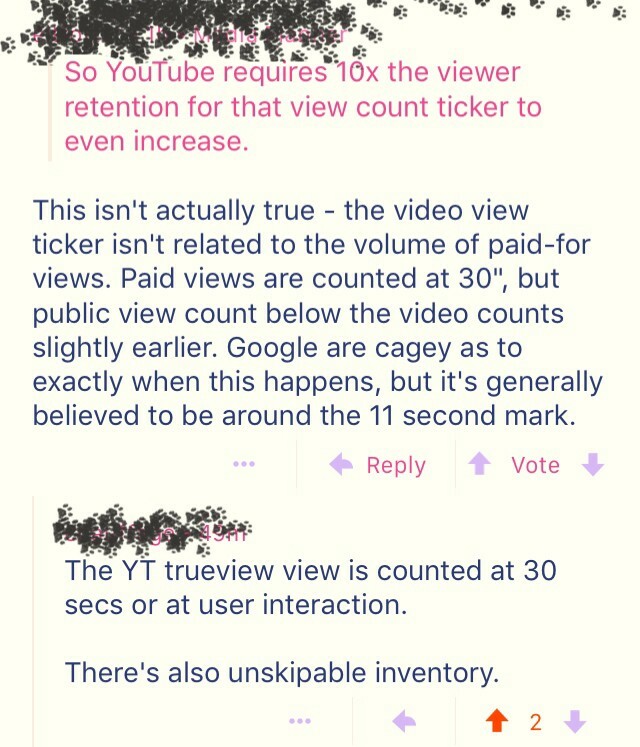 So YouTube requires 10x the viewer retention for that view count ticker to even increase. Moreover, when you see the way an ad is served on Facebook, it already raises suspicion on the quality of viewership. A video ad will auto-play without sound when served as an ad on Facebook. So if you’re scrolling through your timeline, an ad might start playing that you won’t even hear, and if you’re not exactly in a hurry on scrolling down, 3-seconds might go by, and the view count will increase — except you might stop watching after 4-seconds without even hearing the sound. YouTube, on the other hand, delivers video ads in a much different way, granted the nature of the platform is very different. People are already there to watch video, for one. The video ads I prefer to run on YouTube are in-stream, meaning they’re those ads that take over the video player when you’re trying to start watching the video you chose. You can often skip these ads after 5-seconds, except a video view isn’t counted when you skip. A video view isn’t even counted when you watch for 15-seconds, and decide to skip. You’re required to watch a full 30-seconds on YouTube for it to even count. Facebook has already been called out on this disparity between measurement. What they’ve done to rectify this concern is let advertisers only pay per 10-second view. Definitely better than paying for a 3-second view, but it’s still a fraction of the time required to measure a YouTube view. But even still, there’s still some questionable reporting going on in Facebook’s self-serve ad system. When you choose to run a video ad on Facebook and opt for the pay-per-10-second-view model (as opposed to pay-per-CPM), the default reporting “result” of the ad is a 3-second view. They’ll even give you the cost-per-3-second-view as a default. You have to manually toggle the reporting settings to even see how many 10-second views you’re getting, along with the cost-per-10-second-view. Default “result” reporting on Facebook for the pay-per-10-second-view model. So you’re signing up to pay-per-10-second-view but they make you work extra hard to even see the data for the actual result you’re aiming for, and instead, try to trick you by only showing the 3-second view data by default. Something’s not right here. 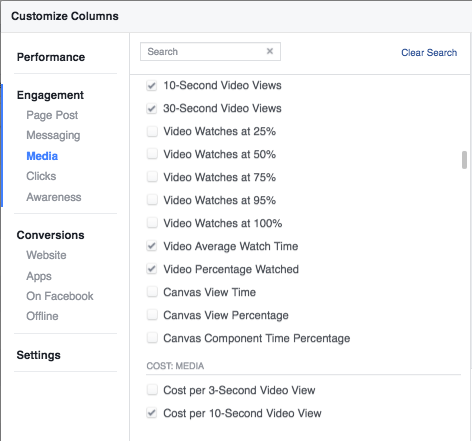 Custom reporting settings for Facebook ads. So if you’re already going in the back-end to toggle reporting metrics, you’ll find the option to report 30-second views. They won’t break down the cost-per-30-second-view for you though, you need to crunch those numbers yourself. So I went through all of our video advertising data from these campaigns and did a little back-to-back comparison. If you’re a newbie to video advertising on social media, the results might shock you. YouTube is nearly 3x as cheap when it comes to an actual engaged viewer who is spending the time to watch what you’re paying to show them. I’ve been suspicious of Facebook video view results for some time, but I was not expecting the disparity in pricing to be so dramatic. So if you’re aiming to spend a decent amount of money on promoting video content, take Facebook’s offerings with a grain of salt. See the visualization of viewer drop-off below to see the gaps between reach, video views (3-seconds), 10-second-video-views, and 30-second-video-views. 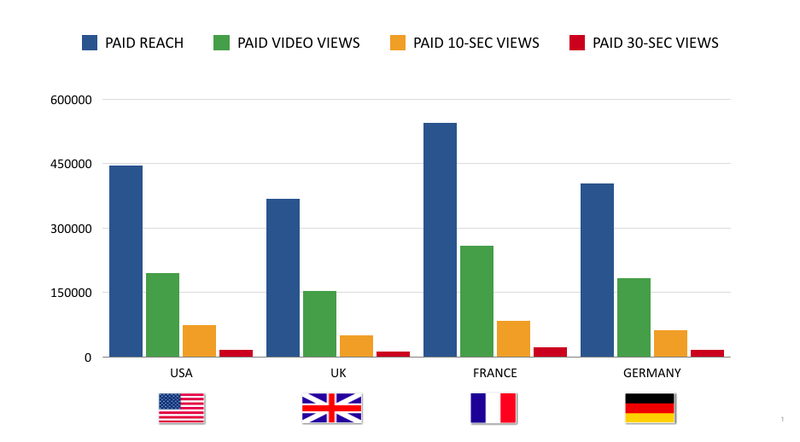 Disparity in results on Facebook video ads in select markets. Facebook already got in trouble for having inflated video view numbers, but supposedly this has been dealt with and now we’re seeing a more accurate picture in 2017. But as ad spending for video content isn’t slowing down on Facebook, these numbers are still being inflated. There’s a big gap between that 3-second to 10-second mark, where a video view on an ad is being counted, but the cost only comes into play when it reaches 10-seconds (so long as you aren’t paying by CPM for video). Here’s a diagram to reflect what’s happening in the counting of “video views” on ads on Facebook. What happens when you run video ads on Facebook with the pay-per-10-second-view model. Going forward, I’m going to take video ads on YouTube a lot more seriously. Facebook isn’t a no-go zone so to speak, as I tend to see much more quality results on stills when charged by engagement. This is another story completely, but video ads on Facebook also count “engagements” as “views” in the Ad Manager system rather than just reactions, comments, shares, and clicks like they would be counted on a still. Videos ads also tend to garner far fewer reactions, comments, shares, and clicks on Facebook when compared to a still. So at the end of the day, it looks like Facebook is treating its advertisers like idiots when serving video ads. Someone gave me a million dollars to get to the bottom of this and I’ll be focusing resources on YouTube for longer-form video ads until Facebook changes their act. New Media in Shanghai — Social / Digital / Creative Marketer & Senior Account Director @ We Are Social in China. Taking Chinese brands over the Great Firewall.